At the end of last month, the Smithsonian National Portrait Gallery in Washington, D.C. unveiled a portrait of actor Kevin Spacey painted by Jonathan Yeo that will be on view through October. 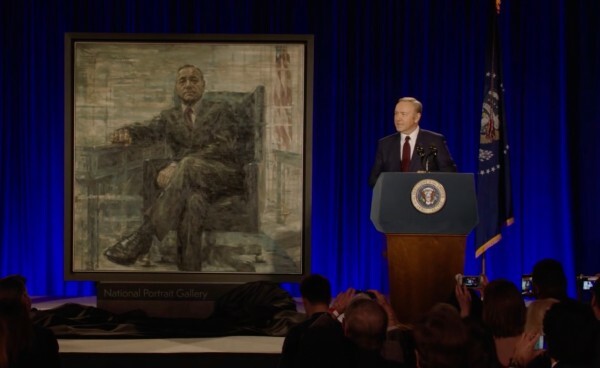 The event featured an appearance by Yeo as well as Spacey in character as Frank Underwood in his role for Netflix’s hit series House of Cards, marking the first time a fictional president had a painting of them hung in the portrait gallery of the institution (although not in the hall of real presidential portraits). The work continues a collaboration between Spacey and the British artist which began with a portrait of him playing Richard III (covered). Categories: Contemporary Art, Videos. Tags: Contemporary Art, featured, Jonathan Yeo, slider-featured, Videos.